Are you getting enough fibre in your diet? Probably not. Are you totally fed-up with those poor excuses for fibre in salt-packed canned vegetables? Fortunately, incorporating the recommended amount of fibre into your diet doesn't have to mean eating salads every day, if you follow these steps. * Figure out how much more fibre you need. * Add fibre to your diet slowly. 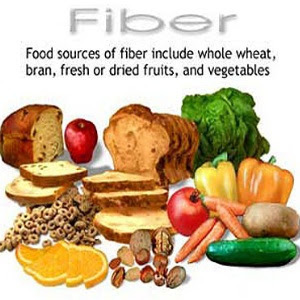 If you are currently getting 10 grams of fibre a day, don't jump to 35 grams of fibre the next day. You need to give the natural bacteria in your digestive system time to adapt to your new fibre intake. What you will want to do is make the following changes over at least a few weeks. * Leave the skin on! Incorporating more fruits and vegetables into your diet will add fibre, but only if you eat the skin, because that is where all the fibre is. So don't peel those apples before you eat them. If you are eating potatoes, leave the skin in the dish, or if you peel them, make a snack out of them, such as baked garlic Parmesan peels. It is also worth knowing that keeping the skin on potatoes when you cook them, will keep more vitamins and minerals in the flesh. Just don't eat any parts of skin that are green. * Try some split pea soup. Split peas is a fibre "power food". Just one cup of them contains 16.3 grams of protein. Split pea soup isn't your only option, however. The following recipes also use split peas: add crushed bran cereal or unprocessed wheat bran to casseroles, salads, cooked vegetables, and baked products (meatloaf, breads, muffins, casseroles, cakes, cookies). Alternatively, find ways to work in ground flax seeds or coconut flour, both which are very good sources of fibre. * Eat whole grains. Whole grains are higher in fibre because they haven't had the outer skin removed through processing. Not only will this offer the health benefits of added fibre, but it can also help you lose belly fat. A diet rich in whole grains changes the glucose and insulin response in your body, which hastens the melting of fat and visceral fat, that deep layer of fat, is easier for your body to burn than the subcutaneous fat under your skin (the fat that you can see and grab). * Replace white bread with whole wheat bread. If that is too far of a stretch for you, have sandwiches with one slice of white bread and one slice of whole wheat bread. If you bake your own bread, substitute whole-grain flour for half or all the white flour. (Use a bit more yeast, or let the dough rise longer, and increase baking powder by one teaspoon for every two cups of whole-grain flour). * Eat whole wheat pasta. Again, if you don't like the taste, mix it with your regular pasta, or eat it in dishes with heavy sauces like macaroni and cheese. * Have brown or wild rice instead of white rice. Alternatively, throw some barley in with your white rice for more fibre content. You will barely taste the barley, especially if you season the rice. Many Mexican dishes also incorporate beans like burritos, enchiladas, tacos, quesadillas, nachos, chili, and hummus.